are applied to the surface of damaged or cracked areas of asphalt. Common areas for this include parking lots, roads, and driveways. If you or someone you know is considering getting some sealcoating work done, chances are you will be getting help from a sealcoating contractor. Before hiring the sealcoating contractor, there are a few things that are helpful to know in determining the quality of the service they will provide. The pre-hire interview is where you can really get this information. At this time, be sure to be aware of or inquire about the following. Which type of sealcoat do they plan to use? Water-based sealcoat is much heavier and recommended for older asphalt that has deeper cracks and more extensive needs. 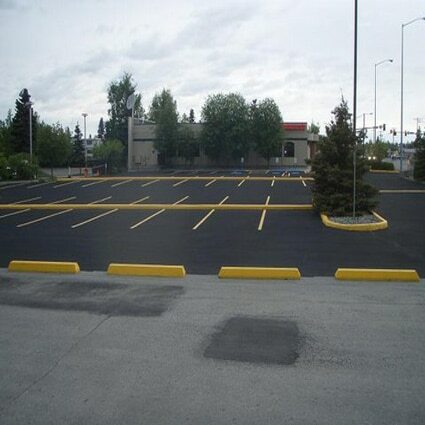 Oil-based sealcoat is only appropriate for less extensive damage and less aged projects. The contractor should only indicate using the proper type per the condition of the area to be coated. Do they use asphalt machines? Real, professional sealcoating contractors will always use machines to mix and work with sealcoating. If your potential contractor is only employing mops, buckets, and basic hand tools, save your money – anyone could do it this way. A professional-grade, lasting product requires the use of professional machinery and equipment. Is there any “cutting” done with the mixture? “Cutting” is the act diluting-down the sealcoating mixture. This can be done honestly to achieve the appropriate mix, or dishonestly, as an underhanded effort by the contractor to save money at the expense of the job’s quality. If the contractor uses more than about 40% water in a water-based mix, they are cutting the mix too much and the job will not last. In oil-based applications, cutting is achieved via the incorporation of additional mineral spirits. In addition, if a sealcoat appears bluish in color, it has been over-cut. These are some of the biggest things to keep in mind when talking to your contractor before service. Please use our contact form or call us at 717-932-8920.